Students will learn how to recognize and remember the vowels as a subset of letters, as distinguished from consonants. Students will become familiar with capital and lower-case forms of vowels. Recognizing and distinguishing vowels from consonants is an important step in the development of reading and writing skills since all words and all syllables in words contain at least one vowel. 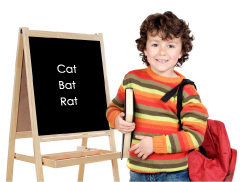 Once students recognize the vowels in both capital and lower-case forms, the stage is set for learning rules and spelling patterns for short and long vowels, final vowels, unaccented vowels, diphthongs, digraphs, silent vowels, and irregular spellings. The vowels in written English are a, e, i, o, u and sometimes y. The letter y is a vowel when it occurs in medial or final position within a word or syllable or when it occurs in initial position in proper names like Yves, Yvonne, and Yvette (pronounced EEV, ee-VON, and ee-VET). (The letter w may also act like a vowel if it follows the letters a, e, or o.) When students have learned to recognize the vowels in Name Those Vowels, they can learn the long and short vowel sounds through the song, Oh, Do You Know? (Sing Your Way Through Phonics, Volume 1). Some other songs that teach students about vowels are the Volume 1 song, Silent E, the Volume 2 Songs, Cool Vowels, The Right Diphthong, and I Before E, and the Volume 3 songs Why Does Y? and Drop It!. Note: If you do not have the CD or Mini-Charts, you can still teach this recognizing vowels lesson plan using the folk tune listed on the Name Those Vowels Song Lyrics page. You can create your own mini-charts using the words in bold print letters in each verse of the Song Lyrics. Distribute capital letter cards A, E, I, O, U, and Y to six students, one card per child. Tell the class that these are the vowel letters and that every word has at least one vowel letter in it. Ask the class to name the vowel letters on the cards. Distribute lower-case letter cards a, e, i, o, u, and y to six other students and ask the students to name these lower-case letters. Set the twelve letter cards on the chalk ledge and call six students to select either a capital or lower-case letter from each set of partners. Ask the six to line up facing the class. (Example: A-e-i-O-U-y) Ask the class to name the set of vowels they see. Repeat Step 6 with one or two more groups, forming other combinations of capital and lower-case vowel sets. Say, “Now we are going to listen to a song about the vowel letters to help us remember them. At first, the singers will name and sing all the vowel letters. Then, you will hear a clap when one of the vowels is left out. See if you can think the names of each vowel that is left out.” Play Sing Your Way Through Phonics Volume 1 CD, Track 7--Name Those Vowels and point to the Mini-Charts on pages 34-40. Point to Mini-Chart pages 36-39, asking what vowels were left out on each page. Play Track 7 again, pointing to the Mini-Charts and reminding the students to just “think” the names of the left-out vowels in their heads and clap for each vowel they don’t sing. Practice singing Name Those Vowels daily for a few days. Then try singing the song without hearing the words, using the instrumental track (Track 8). Allow different students to point to the Mini-Charts words while singing. Using the Mini-Chart Templates, vary the order of vowels (Ex: e-o-i-u-a) and mix upper and lower-case (Ex: I-U-a-o-E). As a learning center task, have students do letter sorts, separating vowels from consonants. Be sure to include capital and lower-case letters. Use plastic letters, letter cards, or Scrabble tiles. Find vowels in books and magazines. Call attention to alternate print forms of the letter a. This might also be a good time to call attention to alternate print forms of the letter g.
Introduce the Read-and-Sing Book, Name Those Vowels. Readers can point to the vowels imbedded in the illustrations while singing this playful song set to the folktune Bingo. Each time a vowel is omitted in the lyrics, singers can substitute a clap, a pencil tap, a knuckle rap, a foot stomp, a rhythm instrument sound, or the word, "Sh!" Keep a few copies of the book at a literacy center equipped with headsets so that students can gain practice in listening, singing, and remembering the names of the vowels. In newspapers, circle words with 1 vowel in red, 2 vowels in blue, 3 vowels in green, 4 vowels in orange, 5 vowels in black. Have a timed contest to see who can find the most examples of each. Winners need to read out the vowels in the words they circled to check for accuracy. Teach students American Sign Language for the vowels. Have them sign the letters as they sing. Compare objects and animals in alphabet books for the vowel letters. For example, one book might display an apple for the letter a while another might display an ape for the same letter. Students pass a written test where they circle capital and lower-case vowels sprinkled in among consonants.